This essay will be a brief description of the camera gear I take on my motorcycle journeys. For those who are not interested in this level of detail, all you need to know is this is all professional level equipment. If I can’t take good photographs with all this, then there is nothing else I could do. This also underscores that good photographs are always more about the photograph than the gear. More will be said about that from time to time. For now, all else here is detail and you can skip. Thanks for stopping by. This is the “default camera equipment I bring with me on photography trips. This gives me a range of 45 mm through 400 mm with excellent image quality. With just three lens, I can cover 90% of the shots I might want to take (the macro lens I find is always handy for quality close ups but you can certainly get by without it if need be; another option is to swap out the 100 macro with a wide angle lens if that makes sense). As for the other 10% of potential photographs I see, I do have an additional seven lens (wide angles, telephotos & super telephotos) but it simply doesn’t make sense to take all those for the occasional times I may need them. At least, that’s my thinking. When I do need these lens, all but two go into a larger carrying bag. The two super telephoto lens (a 300 and 600 lens) have their own hard case because of their size. As you can see, a car trunk is the only option if you insist and bringing all the lens, neither realistic nor needed on a typical photography trip. And that, my fellow geeks, is my camera gear. Almost. I have two tripods, one of which i’d like to bring on the motorcycle and I’m looking into how to do that (the other tripod is for the two super telephoto lens and not relevant here). 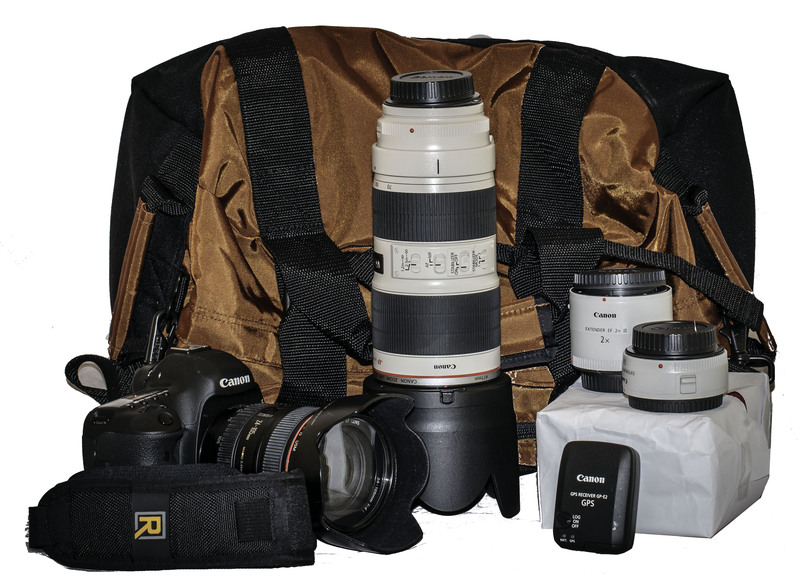 In addition to the 12 lens, I also have an assortment of other gear: a Canon 5D mark II body backup camera, batteries, chargers, filters, flash cards, four Canon flash units, studio lighting, studio backdrops and three different size backpacks to carry various combinations of gear. I believe in doing everything comprehensively, as I’m sure you surmised by now. Now that is everything. Well, camera wise, but I haven’t said anything about the computer hardware and software to process the photographs. I have a 12-core Mac Pro and a MacBook Pro. The Mac Pro has considerable firepower (400 Watts worth; I had to vent to the outside so as not to cook in my studio). It can handle anything I can throw at it in near real-time. The MacBook Pro also holds its own and obviously has the advantage of being portable. For software I use Adobe Photoshop and Lightroom to do all my processing. I have some third party filters I’ve grown fond of: Nik Silver Efex Pro and Color Efex , and Topaz Adjust and Simply. For printing I have an Epson Stylus 1400 for everyday proofing and an Epson Stylus Pro 4880 for archival quality prints up to 17 inches wide. Anything bigger and it’s off to a print service. Okay, now that is truly everything. If you actually have read this far, you know that this is quite a bit of equipment. I have no excuse to ever blame my equipment for a bad a photograph or print. If my photos don’t work it falls 101% on me, never the equipment. And when my photographs succeed, I own a great deal to the three companies who made all possible for me: Apple, Canon, and Epson. Without their research and commitment to excellence, none of this would really be possible except in some lesser manner. I know that sounds like an ad line, but as Little g is my witness, I mean it from the bottom fo my heart. Remember, it takes a village to do anything worthwhile, and so I try to remember that when I press the shutter or edit a photograph or watch a print appear line by line come out of the printer. This is an important factor when it comes to Eudaimonia. Whatever it is you are using to achieve eudaimonia, I believe you will find that “good enough” never is. You will always want it to be perfect, beyond perfect if you can achieve such an oxymoron. It is the nature of seeking true happiness that you will always want to go to another level while you are still satisfied with the level you are at. This contradiction in terms is the nature of this state. In fact, it seems to be the nature of truth. No need to logically explain it, only to accept and relish it. And I do, every last freak’in drop.